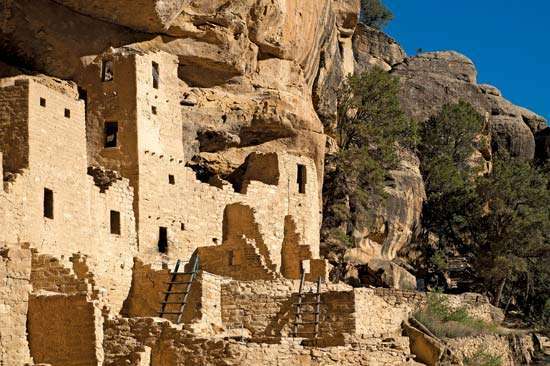 Throughout the Four Corners region of the U.S. Southwest are dozens of stone and adobe towns built into the face of towering cliffs. Most famous are the ones at Mesa Verde, like the Cliff Palace (above). The Tonto Cliff dwellings. 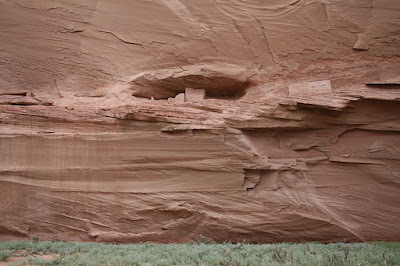 These are in a different region than the big Anasazi cliff sites and are somewhat later in time, occupied from perhaps 1300 to 1350; they may have been built by people who had fled the Four Corners region. 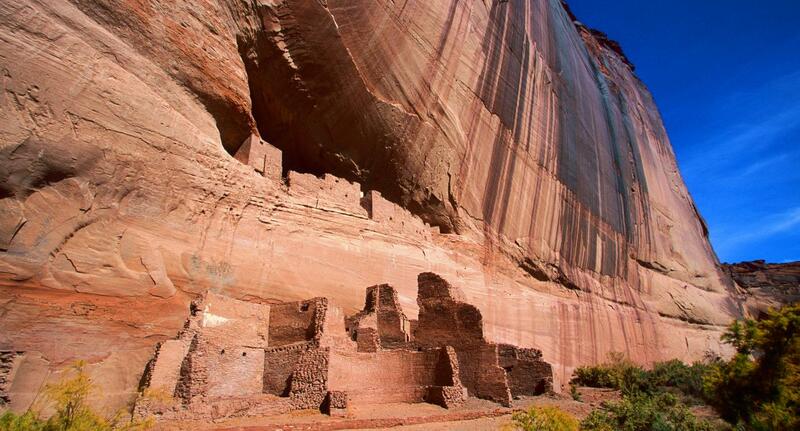 White House ruin at Canyon de Chelly by Ansel Adams. Population booms and subsequent busts tend to be related to economic factors - particularly the discovery of some valuable resource which attracts people wishing to get rich quick. In our own history, we see boom towns surrounding discoveries of metal deposits like gold, underground pockets of oil, and even rich hunting grounds for furs. Whenever something valuable but limited is found in a distant region, people flock to that region from elsewhere to take part in the harvesting or extraction of that resource, causing the boom. We also see that a lot of boom town settlements do end up fortified - often because there is a conflict between local populations and outsiders coming in to capitalize on the newly found resource. Fur trappers built forts because they were invading the territories of native peoples hostile to them. Gold miners didn't build many actual fortifications, but they did rely heavily on the protection of others to retain control of their mines, as provided by not only the official government and law enforcement, but also by private mercenary guns for hire. And oil? We actually have seen both kinds of security employed to protect oil fields, over the years. 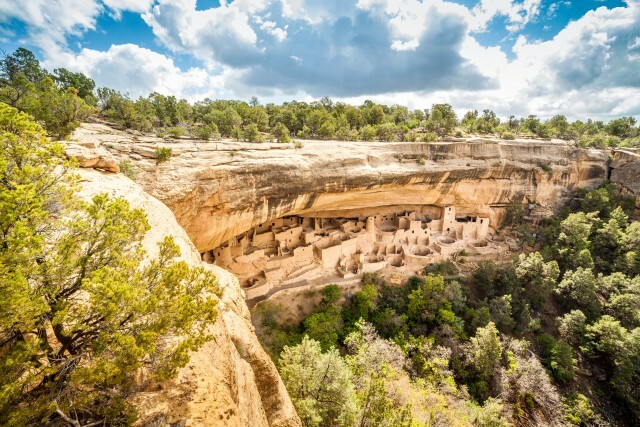 So could it be that the Mesa Verde region at some point possessed a valuable commodity that attracted such a large population to the region so suddenly? Could it be that people flocked there from other regions, and build fortifications to protect themselves from hostile locals, or even from each other as they competed for this resource? Perhaps it was something that wouldn't leave much of an archeological record? Mining leaves obvious signs, but what of a resource that had a purely biological component? Perhaps a drug derived from some local flora or fauna? Perhaps some rare food considered a delicacy? Some unusual desert species that lived only in the local region, but thrived in great numbers - at least until depleted by humans? I'm put in mind of bird's nest soup. An extremely valuable, purely biological and degradeable delicacy commodity, harvested from perilous cliff faces, with fierce competition among those seeking access to nesting grounds. 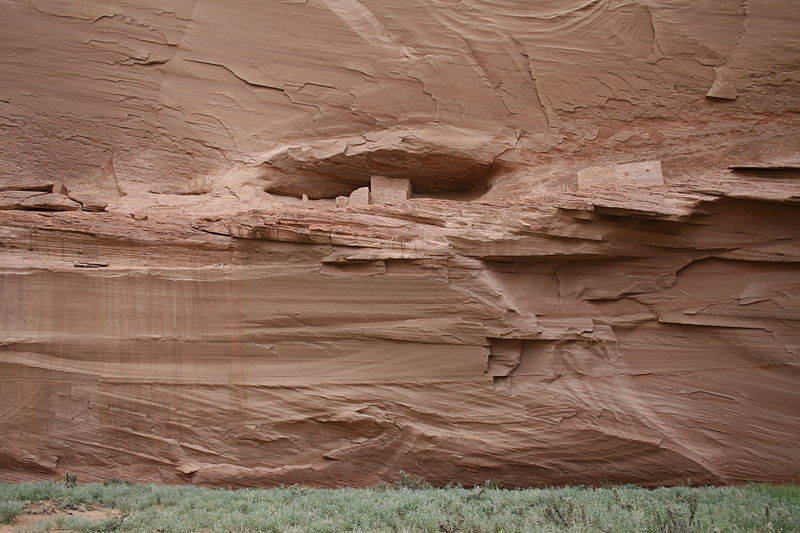 I wonder if the cliffs of the Four Corners region were chosen purely as defensive sites, or if they might also have been the actual source of whatever they were harvesting. 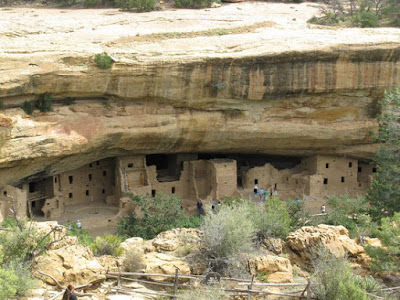 @G, we don't see evidence of especially valuable commodities here (we're a few miles from mesa verde and have extensive ties with the park and its archaeologist staff). what we do have evidence of, is a massive, sprawling community whose population at its height exceeded the current population of the region by a substantial margin. i'll deviate from evidence here and suggest my own theory. 1) populations of large size attract visitation simply because they're large. they attract significant trade, since nearly all densely populated regions simply cannot sustain their population by their own farming. 2) a widely held belief among moderns is that mesa verdeans were highly spiritual if not religious in a more structured sense. we have evidence from all over the world that religion helps cultures form and people work toward common goals. sometimes those goals are irrational. 3) a common explanation from the ancestors of the ancient puebloans (btw @john, anasazi though it's often heard and used, is falling out favor) of why their ancestors left -- not picked up and left -- just left, is because it was time. i snicker at its incompleteness, knowing that when i've said that of myself, there are always reasons, sometimes ones i don't want to admit to others, or i'm so fed up with what's going on (say, in a job) that i just want to wash my hands of it, quit, and move on. 4) we have evidence of warfare and fortified structures, of drought, of malnourishment, of rapid exodus. we have evidence as well of people who had become masters of managing their scarce resources -- little water, poor soil, windy conditions that stunt growth, cold winters and hot summers that favor only certain agricultural crops and all others are excluded without modern farming methods. though there's abundant wildlife such as deer, rabbits and birds, those would have been hunted nearly to extirpation by a hungry population that can't get protein from the feed lot a few hundred miles away. the old saw about "corn, beans and squash" is no joke. that was about it, with some obvious exceptions such as the deer, rabbits and birds. the cultures of the area spent a lot of effort on petroglyphs and pictographs, and when they're recognizable, they are mostly about food, people and procreation. 6) i think the case for widespread warfare is simply not there. i think the case for climate-driven exodus is strong, especially with various factors like potentially strong spiritual leadership, competition for scarce resources causing local violence, and the mostly harsh and unforgiving climate. the climate has been dry and arid here for a long time -- it shapes the soil, stunts the trees, gets everything dusty, stresses crops. 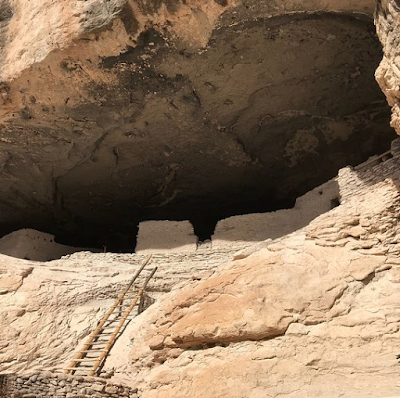 btw, i wanted to mention that if you go into some of the cliff dwellings outside of the big sites, there's not much room in them for anything. sure, people were compact and probably quite skinny, but some of these dwellings are 5x8 feet, and yep they're festooned to cliffs in the craziest ways. ladders, rope and sheer will were appropriate. hand and toe hold trails were chopped into moderate to steep rock faces. one i've seen took them up a sheer wall that is around 600 feet high. it's just nuts. So if I understand what you're saying, the people seem to have left due to environment hardship as time went on, with drought, famine et cetera? That's all well and good, but what inspired people to move into the region to begin with? And what was worth fighting over while they were present, to the point of requiring fortified cliff "castles"? There had to be some sort of commodity in play - whether strictly physical or whether more abstract. I could see religion filling that role, as holy sites are historically something people are quite willing to fight to control, and inspire the contruction of foritications to protect. That said, holy sites overwhelmingly tend to develop around population centers - not the other way around. And so, I wonder what would have inspired people to move into the region to begin with, and what might have led to the establishment of holy sites there to fight over. Perhaps there was a belief in some sort of natural source of healing? Sacred waters, or stones, or even plants? Perhaps some tangible medicine could be produced there from local resources? Or some potent drug or hallucinogen, allowed access to the spirit world? My impression is that the basic reality one must keep in mind in Ancient Puebloan studies is that "no one knows." Huge amounts of work have been done, and more studies are done all the time, but no incontrovertible patterns have emerged. 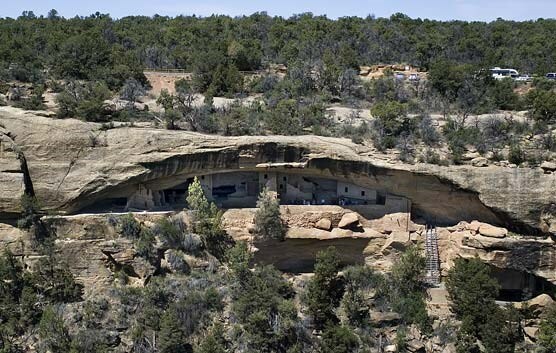 For example, my impression (again) is that no one knows truly why they built cliff dwellings. Plenty of archaeologists will say, "there's no way you can convince me that this wasn't about defense"; but others will make cogent arguments for other motives. Likewise for petroglyphs: leif's sources say, probably with good reason, that this art is about fertility, etc. But the well-respected Polly Schaafsma interprets a whole cycle of these as related to warfare. On the warfare issue in particular, I think there's enough evidence in glyphs, structures, skeletons, and oral tradition, to say that there was a fair amount of fighting going on (as in most human societies undergoing major changes). This was certainly NOT a society built around the profession and technique of war on, say, the Assyrian model, but they weren't pacifists, either (except I'd also bet that someone soon is going to make a name for themselves publishing a major argument for the pacifist model, and so it goes). I think the one thing you could probably say with certainty is that none of what we see happened for one single reason. Environmental archaeologists will tell you about drought, declining deer populations, and so forth, and they're right. But Pueblo oral tradition indicates the people involved, if you asked them why they moved and settled and then moved again, would probably tell you about immorality among the people, insults, faction fights, and taboo-breaking. I think that's important. One point I was trying to make is that we talk all the time about the abandonment of the cliff dwellings in the Four Corners area, but it was only one of at least half a dozen similar abandonments over the thousand years before the Spanish arrived. This seems to have been a pattern of sorts: an area prospered for a while, then mysteriously dwindled, and it seems clear that most of the people moved rather than died. I think environmental stress has to be part of it, but I think that the legends of social strife and sin, and the historical Pueblo and Hopi emphasis on spiritual unity, point to a social-political-spiritual dimension as well. Maybe the prophetic leader of an exodus was a recognized social role. But anyway I think the minute attention given to the environmental circumstances of the abandonment of Mesa Verde miss the point if you can't produce similar evidence for every other such move, and so far nobody can. @David: I think the evidence for chronic warfare in the Southwest is overwhelming, and so do all the other archaeologists I know. The ones who dispute this are, I think, trapped in the same anti-war, Vietnam-era mindset that has corrupted so much of anthropology in our time. The ones who still refuse to believe in prehistoric migrations, despite the genetic evidence. I give zero credence to their views. @John: Actually I agree with you about Puebloan warfare, but I was trying to affect a tone of agreeable mellowness about it. @G, yes that's my belief, that climate-related factors are among the most important influences for large-scale migration. i'd be an idiot to suggest that conflict did not play a role. it obviously did, but i'm not well-researched enough to call it war. for instance, there are isolated areas with terrible, horrible remains of destroyed bodies, but to me that someone had the time to go about this dirty work suggests something other than warfare where i imagine there's constant attack / parry on both sides. it's also difficult to pinpoint any sort of obvious war period during which wars, if they even happened, were engaged in with regularity. but perhaps i'm bringing a modernist perspective to it, and "war" at that point would have been different. special commodities... i simply can't add to that. what's left is corn cobs, some squash seeds, a lot of wolfberry in occupied places, some datura. don't get too excited about datura -- it's everywhere, not just in isolated places like within the confines of mesa verde or chaco. there's no concentration of it, as in some select few controlled it. building structure, especially toward the end of the occupational period, suggest that conflict was expected but i don't see it as a hoard of invaders wreaking destruction everywhere. 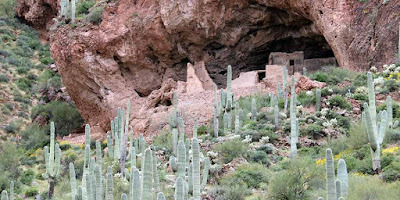 if there had been that direct a foe, no one would have taken time to build curtain walls around their pueblos, build one-room dwellings on narrow cliff edges, and so on. @john, you say "chronic warfare" . help me understand how you view 'war' in this context. per my comment, i suspect my idea of war is a bit warped. do you feel that occasional conflicts where, say, 20-30 people die, and then things go back to normal, is that war in the context of the four corners in the 1270s? regardless of if i have that even remotely right, is that enough to force thousands of people to call it quits, drop perfectly workable mugs and blankets, and head south? maybe it is, but to me that's a weird culture that simply says, "ok, it's time. let's leave before a really bad war happens" ... and they take off. i really just don't see that. i see a complex constellation of factors driving that many people out of an area which not long before that, was surprisingly fertile and was one of the obvious centers of civilization in the area. a couple years of crop failure, where all you *have* has to be from local sources, would be all it takes, i imagine. it's so difficult for so many people (yourselves exempted) to envision a world where nearly everything happens locally, or it doesn't happen at all (i.e., society crumbles and there's mass exodus). this is why i'm in the ecological disaster camp. there's clear evidence of dwindling water supplies, of concerted efforts at creating small dams, even reservoirs, but those do not appear to be widespread. the other influences, and yes they're easy to see as factors, just don't make me feel like they're enough. @david, i concur that war doesn't seem to have been the goal here. piles of evidence suggest fortified structures and structures deliberately placed in defensible positions. they weren't experts at war, unlike how they *were* experts at making structures that lasted several hundred years with no upkeep in a harsh climate. i don't deny that conflict happened, but it's hard to squeeze their ancestors for answers. they simply don't want to talk about it. given what i've seen, conflict was expected and pueblos and other community structures were built to help them withstand that. oh, also, @G, the attraction to the area wasn't exactly sudden. occupation has been documented for over a thousand years, and depending on which dating technique you believe, some pictographs were made nearly 3000 years ago. it was the exodus that was notably sudden. @leif: The scholars I've read generally depict a state of chronic feuding and faction-fighting, something like, say, saga Iceland--not massive invasion by foreign armies/migrants, or organized, decades-long wars between states on the early modern European model. Their notes tend to cite 19th and 20th century anthropological reports on a tendency toward faction within the pueblos. There is a sense that the "we Hopis are peaceful people" schtick is meant both as a cover to keep these facts from outsiders and a palliative for their own divisiveness. There's been a reluctance to use oral tradition, partly for the reasons you cite, partly because some Puebloans hate it when outsiders get a hold of this stuff, and for many other reasons I'm sure. 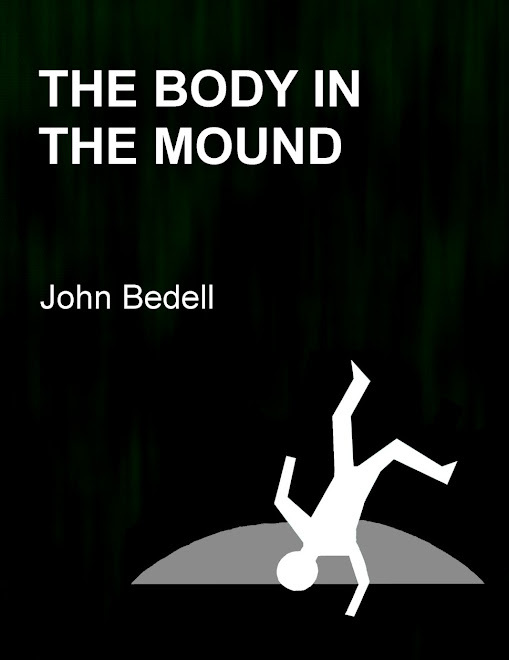 But in the last few years several scholars have been publishing archaeology + oral tradition studies. 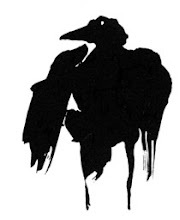 Much of it's related to the Hopis (because of the work of Ekkehart Malotki in publishing Hopi tales--if you're interested in this stuff, you should check out some of his versions, they're fun as well as fascinating). @leif: the whole Southwest has been used by humans for 10,000 years, except maybe for some of the most remote deserts and mountaintops. So there is a background level of human habitation in every region. My understanding is that the building of the towns was still a dramatic departure and a major change, at least at Chaco Canyon and Mesa Verde. 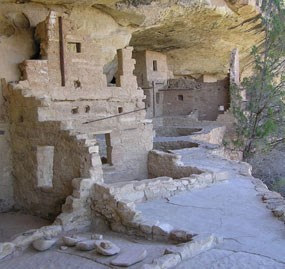 So the rise of the cliff dwelling communities would be an event as dramatic as their departure.